Today, Tuesday 20 November, 6th yr. Juno Ellison was one of three students from Rotary Zone 8, which stretches from Antrim to Castlebar, to win the Youth Leadership Development Competition. This fantastic prize is an all expenses paid trip to the European Parliament in Strasbourg in February. With the other winners from around the country, Juno will visit Stormont and the Dáil where she will meet with politicians and business leaders. From there she will travel to Strasbourg in France where the prizewinners will debate a variety of motions in the European Parliament. To enter the competition Juno had to detail her achievements in leadership and planning and organisation as well as her work experience and personal achievements. Juno found that her active involvement in TY projects was invaluable for her application, as was her involvement in the school musical, debating and sport in 5th year. She then had to attend an interview in Sligo and from there progressed to an interview in Monaghan where she emerged as one of the winners. For the interviews she had to discuss her achievements and demonstrate a good knowledge and critical understanding of social, environmental and political issues in Europe and Ireland. It was a well deserved win for Juno and will be a wonderful addition to her CV. 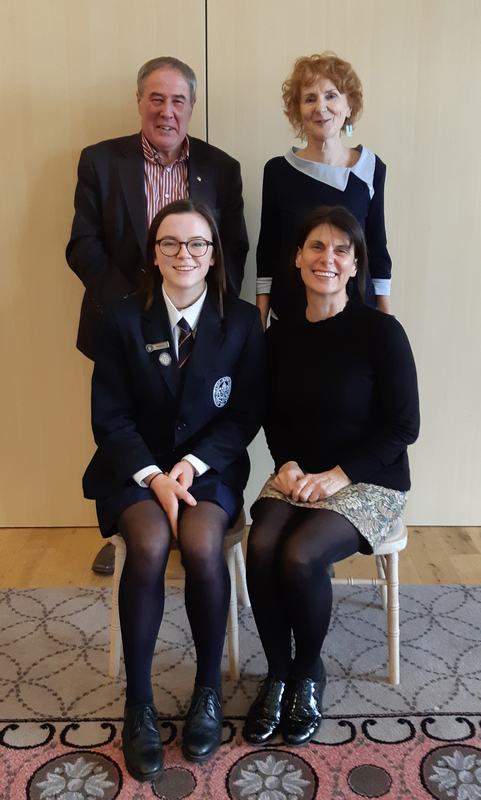 Thank you to Pat McNulty and Arnie Griffin of Sligo Rotary and to Máire Hynes, teacher in charge of debating, (all pictured here with Juno), for their help and encouragement.